At Davam Urgent Care located near Spring, TX we offer a wide range of walk-in urgent care services. Each patient who visits Davam will receive the best care possible from a board-certified medical provider. Our staff includes Medical Doctors, Family Nurse Practitioners, Emergency Medical Techs, Medical Assistants, and Radiology Techs. In addition to a same-day online check-in system, we also offer convenient hours of 8am-9pm, 7 days a week. If you or a member of your family is dealing with a non-emergency issue, visit Davam Urgent Care located at 6022 FM 1488 Magnolia, TX. Along with providing treatment for a wide variety of medical conditions, Davam Urgent Care located near Spring, TX also provides other services. This includes but is not limited to workers compensation (on the job) injury treatment, drug screening, EKGs, sports physicals, school physicals, digital x-ray, on-site lab services, flu shots, TB tests, tetanus shots, and more. For more information on our family clinic located near Spring, TX visit our website at www.Davam.com or contact us at (281) 583-1980. 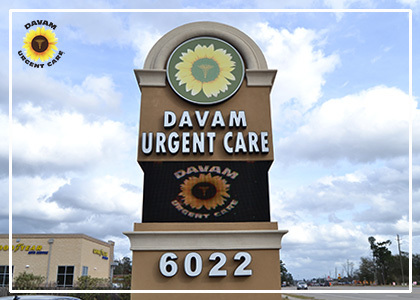 Davam Urgent Care serves the Spring, TX neighborhoods of Augusta Pines, Auburn Lakes, Klein Meadows, Harmony, Dulcet Hollow, Legends Ranch,Spring Village Estates, Spring Trails, Benders Landing Estates, Carlton Woods and more.